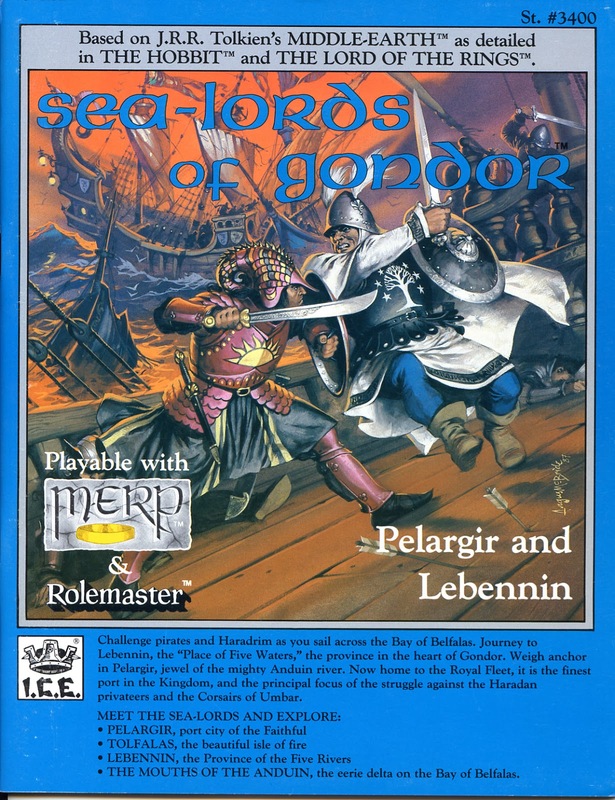 At the risk of sounding like a Castamir sympathizer, Sea-Lords defines the character of a nation better than any other Gondor module. There's even a part of me that thinks the Dunedain would have been better off if the south had won, though that's a matter of very ugly debate, and I personally wouldn't support someone like Castamir anyway -- anymore than my characters did. Bigotry in all forms is benighted. Yet there's no denying the Golden Age under Gondor's four ship-kings, and the benefits to a southern capital with a naval focus remains an open question. Sea-Lords of Gondor has the wisdom not to answer it. In keeping with the spirit of all these modules, it simply presents the facts for DMs and players to mold however they wish. The era of the ship-kings (840-1149) saw Pelargir functioning as the nation's capital in all but name, the home of the royal fleet, and a colonial ambition that ushered in success and peace never again enjoyed by men in the Third Age. What killed Gondor's prosperity was the shift from a seaward focus to a landward one, especially by the 1300s, coupled with a morally enlightened thinking favoring allies over colonial subjects. Minalcar was a good man, but a highly questionable king in sending his son to wed a Northman princess; from that point, racist fears of a polluted line were all it took to cement the more substantive charge that the royal court at Osgiliath was failing its mandate. Which in some ways it was. The characters I regularly played in Middle-Earth were a product of the Kin-Strife (1432-1447), and one in particular was a fighter from Calenhardon: a rabid Eldacar-zealot who became conflicted after seeing Pelargir for the first time. I wasn't too philosophical about the matter back in those days; I just thought it fun to run a PC with volatile allegiances. But his Castamir complex turned out very believable; we're often attracted to that which repels us. In hindsight I see his sudden affinities with the southern cause similar to the apostle Paul's conversion to the Christian sect he persecuted so violently, or the abrupt 180-degree turns of murderous fanatics like Sadhu Sundar Singh. Pelargir had that weird sentimental effect on him. As for that City of the Faithful, its four-page display is beautiful, and if the contest between it and Minas Anor were determined by ICE's mapwork in these modules, I'd pronounce Pelargir the capital at once. 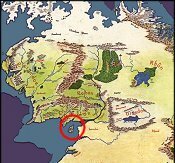 It's built on a triangular plan at the junction of the Sirith and Anduin, the Sea-Lords' Tower claiming the center on an isle where the Lord of Lebennin (often the Prince of Gondor) resides. In the southern quarter is the Hall of the Faithful, which I had fun designing in more detail, the sacrosanct building containing statues of Numenor's greatest men, Second-Age relics, and the Glass Hall of with an inlay of the White Tree. Then there is Minas Daldor which guards the mouth of the Anduin, ruled by an insane bard believing himself to be a god ("The Dark Fire of Numenor"). This fortress is cleverly designed, with hallways and furniture that get bigger the further one proceeds. To the northwest of Pelargir is a haunted tor infested with semi-aquatic rodents, and the lost treasure of rebels who fought against Castamir during the civil war. It all conveys a feeling that the sea-lord province somehow wears on you after a while, that pride and ambition yield rebellion and madness... and perhaps, in the end, that's the answer to our question. Next up: Corsairs of Umbar.